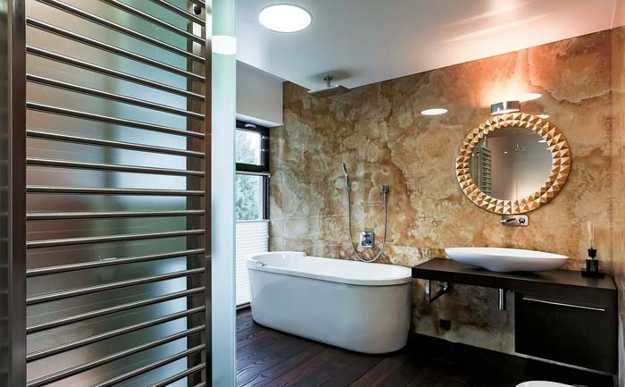 Beautiful interior design ideas turn a house in Tallinn into a gorgeous retreat, offering peaceful and stylish home interiors for stress-free lifestyle. 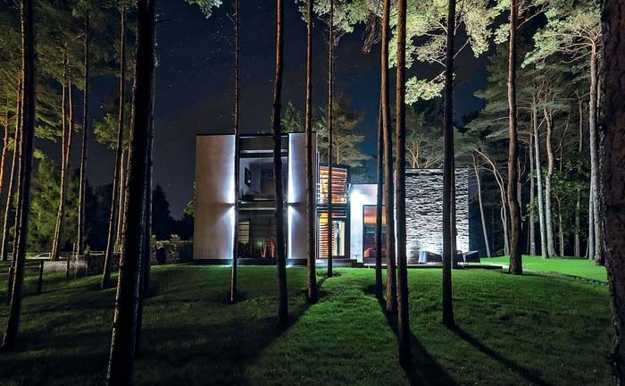 The modern house is located in Tallinn, the capital of Estonia and offers a pleasant home surrounded by pine trees creating wonderful environment for residents that enjoy privacy and quiet atmosphere. The modern house design is a project by architectural firm Arch-D built by Talsar Ehitus, creating a gorgeous urban villa that feels elegant, welcoming and luxurious, while reflecting the taste and preferences of customers. The house design, exterior and home interiors create a fantastic home merging with natural surroundings in harmony and style. 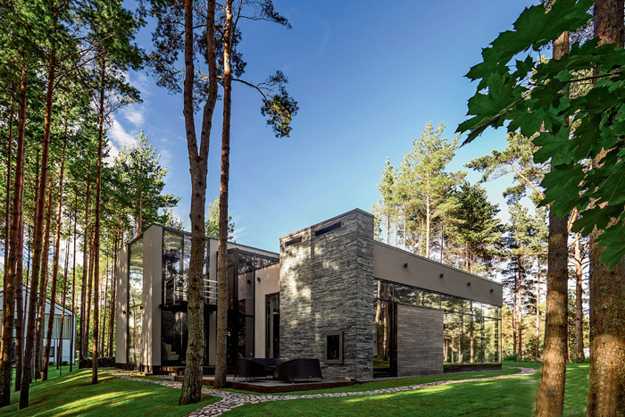 The modern house design features two rectangular volumes connected by a gorgeous transparent insert. The house exterior design shows an attractive blend of several natural materials, – local stone slate, heat-treated ash wood and glass that work together creating this beautiful house. 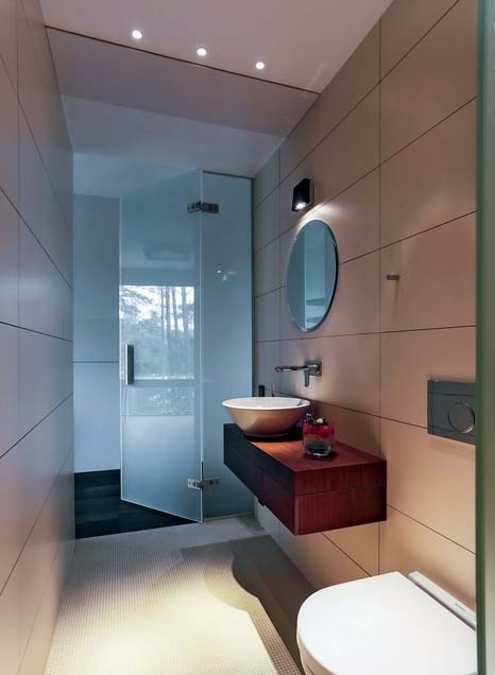 Decorating with glass surfaces creates a sense of unity with nature and brightens up modern home interiors. 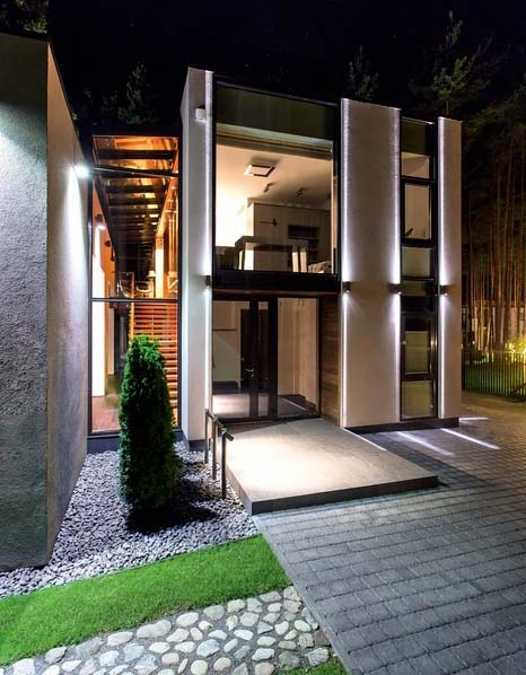 Large windows and glass walls contrast with wooden walls and stone elements at night, making this house design look very attractive in the dark. 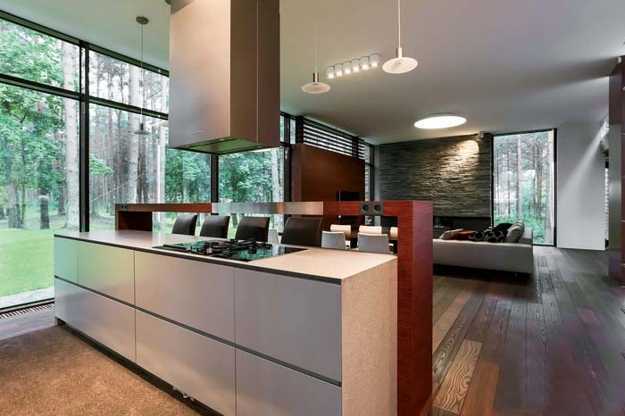 The color palette is inspired by pine tree bark, and add another element of modern interior design that connect these home interiors with surrounding landscape and harmoniously blend the house exterior with the nature. 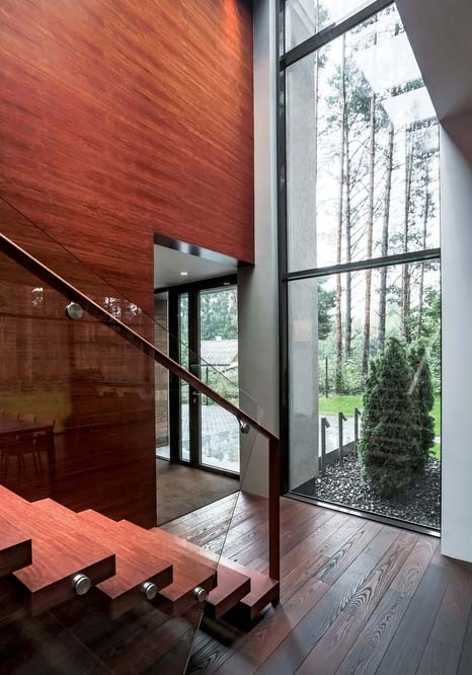 The metal, glass and wood staircase design connects two floors and add a fabulous architectural element to home interiors with glass walls. Bright and contemporary staircase design looks light and weightless, adding a floating feel to home interiors. 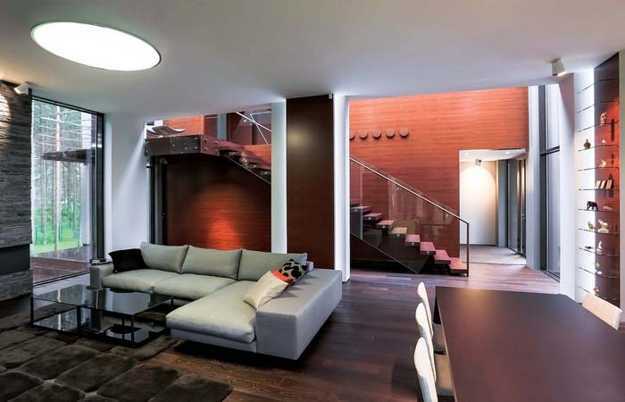 The first floor features two zones separated by a staircase. The living room with a dramatic stone fireplace, dining room and kitchen interiors create an open and spacious living space. The guest room, home office, bathroom and utility room are located on the first floor also. 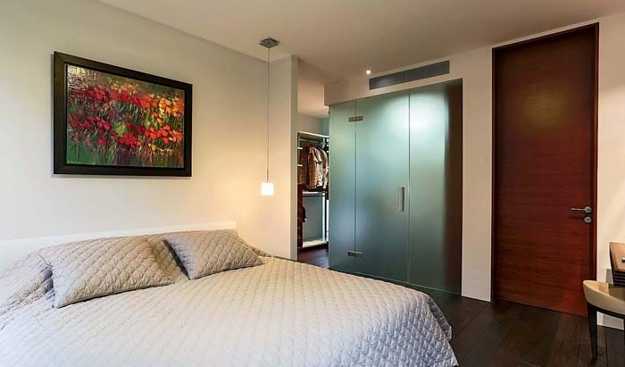 Two bedrooms with en suite bathrooms and a dressing room are located on the second floor. 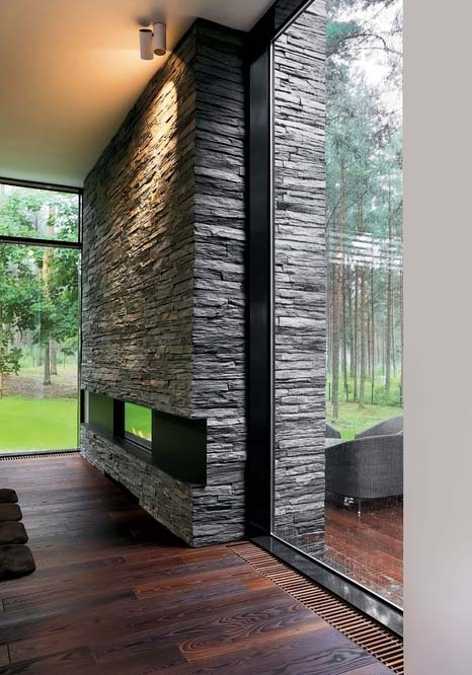 Gorgeous, made of stone and wooden walls, create very attractive architectural interiors with glass elements, blending modern interior design with the nature and providing privacy. The rooms and outdoor terrace floors are made of the same material. The heat-treated ash wood floors bring continuity into exterior and interior design, expanding home interiors to outdoor rooms.